“We hope that people will take time to sit on these benches under the trees and reflect on the meaning of peace,” says Karen Peters, chair of the church’s 75th-anniversary celebration committee. The peace pole was planted on Peace Sunday, Nov. 12, 2017, when the congregation observed the 75th anniversary of the church and the 500th anniversary of the Reformation. The peace garden was blessed on Sept. 30 of this year, when the congregation celebrated Thanksgiving. 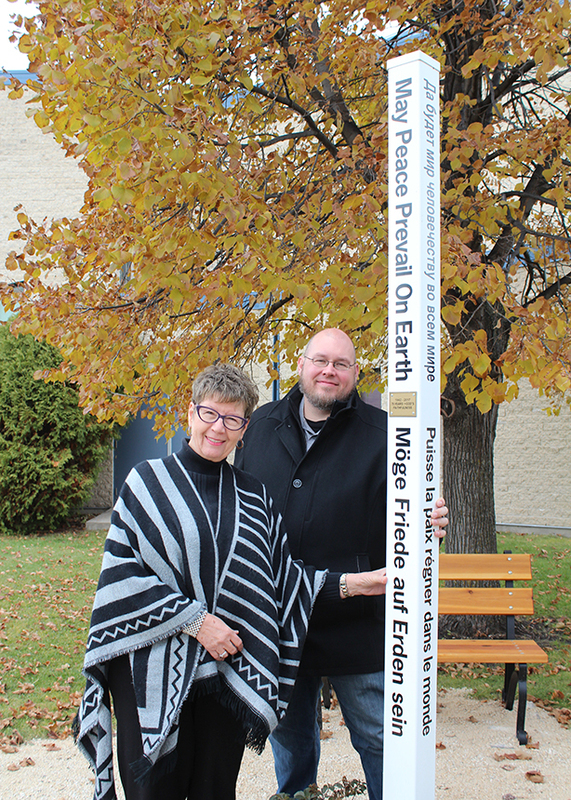 For Peters and many others in the congregation, the peace pole project also reflects God’s desire for peace and reconciliation among all people who have been wounded by disunity and divisions in the church community. “It is a silent but visible reminder to reconcile what needs to be put right and to move on in a spirit of harmony,” she says. In 2016, just as the church was beginning to plan exciting 75th anniversary celebrations for 2017, theological disagreements and cultural differences created disunity. Pastors and congregants gradually began leaving. 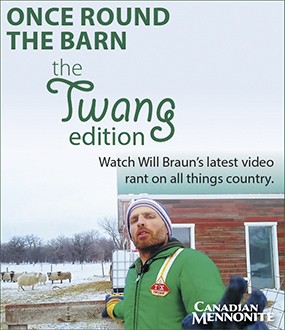 Following the cessation of the German service in early 2017, about two-thirds of the congregation had walked away from Steinbach Mennonite. Those who left did not start another church but scattered in many directions. A congregation of about 120 remained in a building that has an 800-seat sanctuary, a large foyer, a combined gym and banquet hall for 500 and a large second-floor education wing. One of the many painful aspects of so many people leaving was the absence of children and youth. The second-floor education wing was now empty. When the task force’s findings were presented to the membership, a decision was made to remain as a congregation, stay in the building and hire Victor Kliewer as an interim lead pastor. Steinbach Community Outreach, a church-supported ministry begun in 2008, was using a large room in the church for distribution of food and clothing to people experiencing homelessness or poverty. This ministry had grown to become a charitable organization with its own board and had plans for expanding services. A decision was made to offer the majority of the upper level to Steinbach Community Outreach. The second floor of the church is now an inviting drop-in centre complete with a kitchen area for cooking and nutritional programs. Former Sunday school classrooms are filled with donations of clothes, shoes and toiletries for distribution. A year later, amidst restructuring efforts, Peters says the congregation is enjoying an increase in the number of children attending and the return of a vibrant spirit within the congregation. In her reflections at the Thanksgiving blessing ceremony for the peace garden, Peters spoke of how the plants in the garden celebrate the church’s heritage and God’s faithfulness. She concluded her remarks by saying: “May this peace garden serve as a silent visual of a common wish—a permanent reminder to think, speak and act in a spirit of harmony. It is our prayer that all who pass or visit this site be encouraged to promote peace beginning with themselves and their family.